The GRP flat roofing project at Kings Cross Square, London. Kings Cross Station, London, UK. 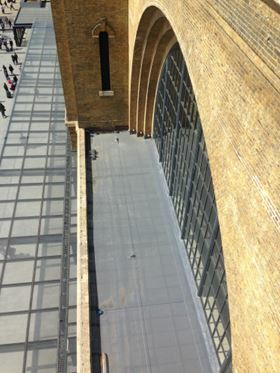 The two flat roofs on either side of the central clock tower of the Southern Colonnade entrance at King’s Cross Station in London had to be refurbished due to extensive sagging and leakage problems. The old bitumen bonded felt roof that had been in place for many years was beyond repair and needed to be replaced. This refurbishment project was initiated by Network Rail, which set itself the objective of having a new flat roof installed which could be expected to last for at least 20 years. Since even modern triple layer felt systems are typically only guaranteed for 10 years, Network Rail looked at alternative flat roofing systems to replace the bonded felt roofing. The system finally specified by Network Rail was Scott Bader’s CrysticROOF BBA Premier, a seamless, cold applied, liquid resin glass fiber reinforced (GRP) roofing system. As part of the rigorous specification and product approval process, a representative from Network Rail’s asset maintaining department visited Scott Bader’s UK plant in Northamptonshire, where the CrysticROOF unsaturated polyester resin and topcoat GRP raw materials were developed, and are manufactured to ISO 9001, ISO14001 and OHSAS 18001 standards and procedures. Samples of the CrysticROOF materials were also submitted to Network Rail and subjected to a variety of in-house technical tests before finally gaining approval for this project. The CrysticROOF Premier system meets BS476 Part 3 for all roof structures and shapes including: flat, valley and pitched roofs, walkways, roof-lights and balconies. When correctly applied, it provides long term UV resistance and weathering performance, remaining watertight and maintenance-free for many years. The CrysticROOF range of cold-applied GRP roofing products was developed specifically for new flat and pitched roof designs. It is a fully BBA approved flat roofing system, which now includes a fire resistant (FR) isophthalic topcoat as standard, helpings installers and contractors avoid the risk of not meeting fire safety legislation and building regulations. All CrysticROOF products are fully compatible with standard roofing materials commonly used for fabricating cold liquid system GRP flat and pitched roofs. CrysticROOF BBA Premier has also been accepted by the NHBC as an approved GRP roof waterproofing system to NHBC Standards 2011, Part 7 Roofs, section 7.1 for flat roofs and balconies and 7.2 for pitched roofs, provided the roof is installed, used and maintained in accordance with the BBA certification.